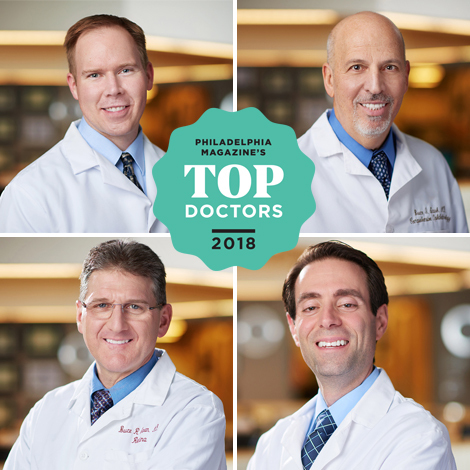 We’re pleased to announce that, once again, Chester County Eye Care ophthalmologists have been named Philadelphia magazine Top Docs™ 2018. This year, four of our surgeons made the list- Drs. Bruce Stark, Bruce Saran, John DeStefano, and Michael Ward. Join us in congratulating them on this prestigious recognition for their dedication and expertise in the ophthalmology field. Dr. Bruce Stark is a comprehensive ophthalmologist with expertise in diabetic eye care, blepharoplasty, and glaucoma. Dr. Bruce Saran and Dr. Michael Ward are retina specialists experienced with the treatment of macular degeneration, diabetic retinopathy, retinal tears and detachments, and other retinal disorders. Dr. John DeStafeno specializes in cataract surgery, LASIK vision correction, and corneal disorders. To schedule an appointment with our eye doctors, please call us at (610) 696-1230.